$50,000 below appraisal! New price! $50,000 price drop. Beautiful lake access with dock & ability to add a mooring. Imagine sitting on your front porch watching the sunset after taking a swim, kayaking or boating from your private shared beach in Charlotte Vermont! This 3,572 sq foot five bedroom, five bath home is situated in Charlotte's highly desirable Hills Point area. Remodeled kitchen and bathrooms with all the right choices! Plus a terrific 1,620 square foot post and beam addition ideal for entertaining, a home office, gym, and/or bedroom for hosting family, friends or guests. The home has lake access virtually across the street. The house has a charming cape architecture with living room, dining room, den, powder room and large family room off a contemporary kitchen. Second floor has 2 master suites and two bedrooms with shared bath, plus bonus room. The 34 X 30 mahogany deck is wonderful for entertaining or relaxing & faces open fields during summer & access to snowshoeing & cross country skiing during the winter. Property is on 1 acre and has beautiful landscaping with stone walls & established perennial gardens. The home has a heated two car garage & a 20,000 watt Kohler backup generator. Current owners have added many upgrades & this warm & friendly home shows like a model and ready to move in! Home & office are wired for Comcast high speed internet access & cable. A terrific opportunity to have lakefront on Lake Champlain without the high direct lakefront taxes. Treasured views and private access to Lake Champlain from this custom built home located in the exclusive Wings Point community. Architecturally designed 4 bedroom and 4 bath with a bright open floor plan focusing on the spectacular western lake views. First floor features include a sunken living room with a floor to ceiling Panton stone wood-burning fireplace, formal dining room, gourmet kitchen with 4 season sun room/ breakfast nook and a guest suite with full bath and French doors to the stone patio. The second floor features a large family room with a second wood-burning fireplace, wet bar and exterior stairs to lower level deck; children's wing; and a master suite with gas fireplace, home office and master bath with jetted tub and glass-block shower. Extensive landscaping, garden shed, three car garage. Association amenities include two Har-Tru tennis courts, shared beach and dock with boat slip. Less than 30 minutes from Burlington and approximately 6 nautical miles to Essex, NY. A private half-mile cedar lined drive leads to this remarkable lakefront residence in desirable Charlotte, Vermont. 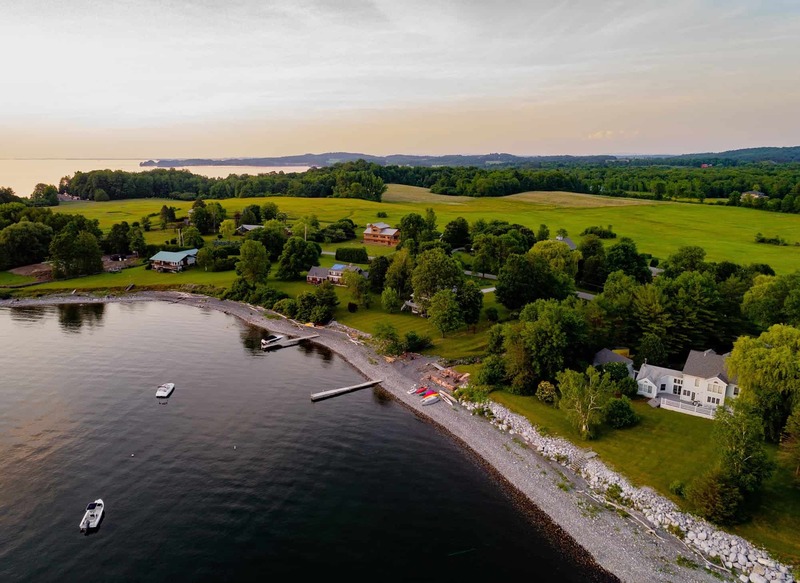 The contemporary 4 bedroom, 6 bath Adirondack style residence is perfectly sited on the 21 acres to take advantage of the expansive westerly views of Lake Champlain and the High Peaks of the Adirondacks beyond the over 900 feet of shoreline. Incredible woodwork throughout. In ground heated pool and pool house, outbuilding large enough for hockey rink in winter! 2.8+/- acre very private Lake Champlain lakefront location with over 800 feet of shoreline. Current 4-bedroom Cedar clapboard residence was recently renovated and is sited within 35 feet of the shoreline. The site is grandfathered. Expansive westerly lake and Adirondack mtn views over the flat rock beach with a wonderful mix of cedar and oak trees surrounding. Other buildings include a detached 2 bay garage/boat storage, lakeside sauna, and an unfinished A-frame cabin in the woods. ROW to lake from Lot 2 over this lot TBD.